Behind a complex definition hides a very useful combat ability to change the angle of the tank’s hull in all directions or the ability to ‘hunker down’ the vehicle, seriously reducing its height. Of course, only on vehicles that use this type of suspension. Japanese tankers will be the first to try this new mechanic in battle on the Type 74 and STB-1 top-tier tanks. Full freedom of action! By default, you will be able to control the suspension with a numeric keyboard, and the tactical opportunities will amaze both the driver and his enemies. Add hull angling to the usual weapon angling toward the opponent and attack them while remaining practically untouchable to return fire. 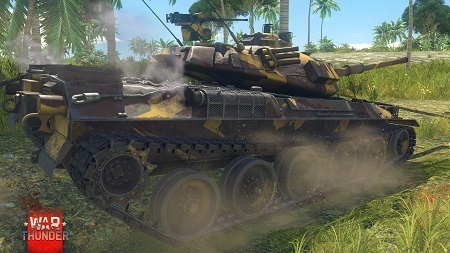 Settle the tank down and use even low cover to safely hide your vehicle, then suddenly, without showing your hull, jump out and take your shot. Get to grips with this new technique in full and figure out new tactics in battle. Japan’s top tanks will become truly interesting vehicles that are worth striving to obtain, and they will add a new dimension to the locations you’re used to in War Thunder. Tankers, meet new tactical opportunities in update 1.65 "Way of the Samurai"! stona please this music is great, dont add music background with a loud volume, we wanna hear the tank as well. This video is perfect. 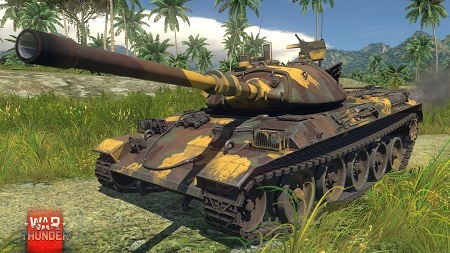 Wait for a release, I am pretty sure our live.warthunder community will handle that part with paint job. i just imagine Gaijin staff standing at the wheel of Fortune in the office asking: "so what do we add this patch? ", maybe regenerative steering this patch too? TifanyGetBlacked, you mean neutral steering? what!?!? and let ~1970 tanks actually turn like a tank instead of anchoring in place and struggle to move? MADNESS!